(Bloomberg) -- All the tensions that have rattled Brazil traders over the past few weeks have done nothing to shake Teresa Barger’s optimism over the country. Local assets have jumped whenever government leaders back the reform or crumbled on news that signal potential delays. One such case was last month, when stocks and the currency slumped as President Jair Bolsonaro traded barbs with key allies including lower house Speaker Rodrigo Maia, who after days of back-and-forth said he would leave the government to gather support for the bill by itself. A spat this week between Economy Minister Paulo Guedes and lawmakers that ended with the economy czar being escorted out of a Congress committee by security after tempers flared had the same effect. Barger says stocks will rise with the economy picking up by the end of the year, and the pension reform will further boost gains. She sees a 60 to 70 percent chance the bill is approved this year, and says it must generate at least 600 billion reais in savings to keep markets confident. Cartica significantly reduced its investments in Brazil before the recession that started in 2015, and piled back in about a year later, betting that inflation would ease and allow interest rates to go down. The fund currently has 18 percent of its assets invested in five Brazilian stocks in the consumer and industrial sectors. One of Cartica’s largest holdings is Rumo SA, a railway company that’s seen shares more than triple in value since July 2016, when Barger said she started buying the stock on a bet lower rates would make it easier for the company to deleverage. Since then, the central bank has cut interest rates by more than half to a record low of 6.5 percent. Rumo’s net debt to Ebitda ratio fell to 2.5 last year, from 6.7 in the end of 2015. The proposed overhaul of the pension system could save more than 1 trillion reais in a decade, and is seen by economists and investors as crucial to shore up the nation’s fiscal accounts and boost an economy that’s still struggling with low growth. 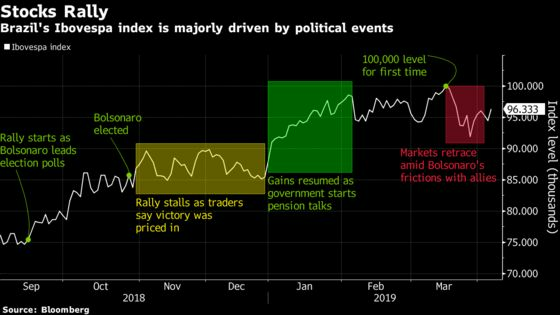 The rally in stocks, which reached a record earlier this year, has been driven by hopes the reform will pass, as well as solid corporate results after companies drastically cut costs to cope with the worst recession in a century. Barger said there is momentum to get the pension reform approved, but grants she doesn’t think it will be a smooth process and markets could weaken if there are delays. “I would see that as a buying opportunity,” she said.